Writer's Nook: Lying Low for 21 more days till Christmas! Only time for a quick post tonight before bed. The carol is "Infant Holy, Infant Lowly" which is slightly more known than the previous three I posted, but it's a gorgeous, Polish carol to sing. Again, my mom and I sang it last year as a duet for caroling. 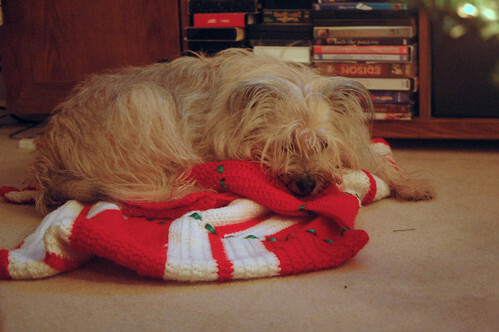 The picture is of my dog, Sandy, doing her usual annual routine of sleeping on the tree skirt until we finally wrap it around the base of the tree. Funnily enough, she doesn't dare touch it then. What a scaredy-cat we have for a dog. But she's cute alright!